Finland's Sargeist have returned with a new recording which continues the misanthropic and satanic style of black metal that they are known for and this is a review of their 2018 album "Unbound" which was released by W.T.C Productions. A very fast and raw sound starts off the album along with a great amount of tremolo picking and blast beats while the vocals are mostly high pitched black metal screams which also have their deep and grim moments at times along with the riffs also adding in a decent amount of dark sounding melodies. All of the music is very heavily rooted in the old school Finnish style while the solos and leads are done in a very dark and melodic style along with the songs also bringing in a great mixture of slow, mid paced and fast parts and the music always sticks to a very dark, raw and heavy musical direction. 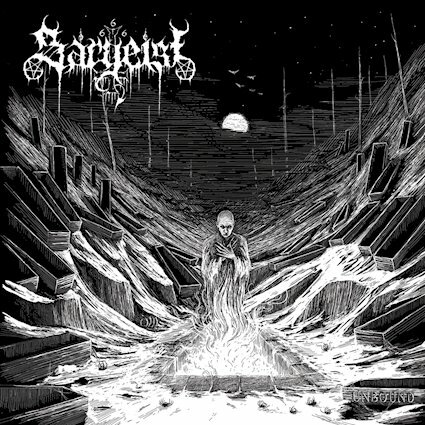 Sargeist creates another recording that remains very true to the raw, satanic and misanthropic style of black metal they are known for, the production sounds very dark and raw while the lyrics cover Satanism, Evil, Depression, Misanthropy and Nihilism themes. In my opinion this is another great sounding recording from Sargeist and if you are a fan of this band, you should enjoy this album. RECOMMENDED TRACKS INCLUDE "Psychosis Incarnate" "Death's Empath" "Unbound" and "Grail of the Pilgrim". 8/5 out of 10.